Website industry is constantly growing across the world, but in a country as large and varied as India, the growth is only magnified. The growth in small cities is something that cannot be ignored. Web Bazaar is set for help at least a million organizations in India to Get on the web and Get found online with moderate sites. India as a nation is to a great degree immense and fluctuated. We understand that achieving the remote corners of India is intense. Additionally, that in each district individuals like to work with nearby agents. In view of that, we chose to make an establishment opportunity that can help to attain two targets. A) Empower new entrepreneurs with another plan of action that energizes business enterprise. B) Give a neighborhood business proprietor the solace of working with a nearby individual he knows and can trust. Web Bazaar is on a mission to help atleast a million businesses in India to Get online and Get discovered online with affordable websites. India as a country is extremely vast and varied. Our culture, language preferences, timelnes, ettiquettes everything chages every 1000 kilometers we travel. We realise that reaching the remote corners of India is tough. Also, that in every region people prefer to work with local representatives. With that in mind we decided to create a franchise oppurtunity that can help achieve 2 objectives. A) Empower a local representative with a new business model that encourages entrepreneurship . B) Give a local busiess owner the comfort of working with a local person he knows and can trust. 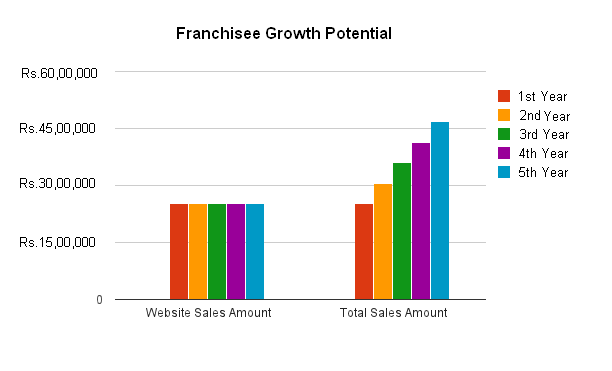 This is how our Franchise Opprutunities have come up and we are excited to reach out to newer regions with the same. Becoming a part of our franchisee business network is an ideal platform for you to expand your business horizon. There are a myriad of franchise opportunities in India and many a times one struggles to make a choice from amongst them. Web Bazaar franchise opportunity is best suited for people who have confidence in their abilities and are hesitant to make a huge upfront investment. We are focused on partnering with people having the right attitude and not so much on how much investment they can bring on board. If you would like to browse through a more detailed list of questions, please check out our Franchisee FAQs. A Web Bazaar franchisee can start in as little as 2 weeks, with an office space and a sales team:- focused on selling website packages to local businesses. When you sign up a customer today by selling him a website say at Rs. 16,000/- The customer pays an annual service fee for domain renewal and regular maintenance. As a franchisee you would get a commission from the renewal fee as well, although your effort in collecting this payment is minimal as our centralized billing department directly collects payments. This is where the Web Bazaar Franchisee system shines. Even with no hike in annual sales, a Franchisee can increase his profit margin with the renewal fee obtained from existing customers. Franchisees can also benefit from SEO sales with a 15% commission, SEO sales start at Rs.8000 per month for a minimum of 6 months. Newbie Entrepreneurs need to focus every one of their endeavors on getting their business up and running. In any case, this doesn't generally incorporate the time required in getting the hang of the product or different tools that the business employment. No eCommerce stage ought to require days/weeks to ace. Luckily, with OpenCart developer tools, you can be guaranteed that your online store will be prepared in a brief span outline. Because of its straightforward nature, an eCommerce site can be effortlessly made, overseen, altered notwithstanding when you have next to zero specialized information. OpenCart is anything but difficult to utilize and extraordinary for amateurs who can utilize it with insignificant outside offer assistance. Apart from this a franchisee can expect 30% of clients to request for a redesign in their 3rd year of subscription.